Give Your Smile the Makeover of a Lifetime in a Single Appointment!Invisalign: Do the Benefits Outweigh the Time and Cost of Braces? With Dr. Andres de Cardenas, he makes it a point to let every patient know that he looks at them as a member of his family, more so than simply another name on a dental record sheet. Your first routine dental visit with “Dr. Andy” and his team is a welcoming experience, inside of a family environment. Our dental practice wants to impart some information to help potential new patients to understand what they should expect from an initial visit. Hopefully, this will enable you to schedule your time efficiently while alleviating some of your dental anxiety. Intake with Dr. Andres de Cardenas is very similar to a typical dental or other medical intake procedure. We will require that you fill out some forms that outline a bit of dental and medical history. Furthermore, you can always request that your old dentist sends your records ahead of the appointment to exacerbate this process. Fill out the information sheet honestly with clear, specific information. This will help Dr. de Cardenas assess any potential risk factors, even modifying treatment options. We can also discuss the potential price of future dental care and insurance during your first routine dental visit. 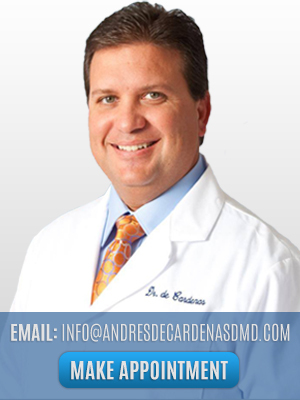 Dr. Andres de Cardenas will meet with you before performing an examination. He will typically conduct this meeting in an office as opposed to an examination chair, feeling that this helps propagate and foster conversation while easing apprehension. No matter the reason for your appointment, either a reactionary or routine dental visit, you will require a dental examination. Dr. Andres de Cardenas will examine your mouth, looking at your teeth for any apparent problems or indicators. Your routine dental visit will also likely include some form of dental cleaning. This includes removing plaque, flossing, and a deep clan procedure. These modalities help preserve your oral health for the long-term, ensuring your teeth remain preeminently clean. Depending on the current state of your teeth, this process will take somewhere between 15 to 45 minutes. However, any anxiety about this initial, routine dental visit is unnecessary. You shouldn’t feel anything more than a bit of sensitivity from a Dr. Andy cleaning and examination. Visiting a new practice for a routine dental visit is very similar to beginning a new friendship or relationship. This meeting is typically a little awkward at first but should feel natural once you get to know each other. For more information on how Dr. de Cardenas can help you, as well as the reasons to attend our practice for a routine dental visit, contact our caring and concerned team today!